Through all the years of strife and triumph, America has been shaped not just by our elected leaders and our formal politics but also by our music—by the lyrics, performers, and instrumentals that have helped to carry us through the dark days and to celebrate the bright ones. From “The Star-Spangled Banner” to “Born in the U.S.A.,” Jon Meacham and Tim McGraw take readers on a moving and insightful journey through eras in American history and the songs and performers that inspired us. Meacham chronicles our history, exploring the stories behind the songs, and Tim McGraw reflects on them as an artist and performer. Their perspectives combine to create a unique view of the role music has played in uniting and shaping a nation. Beginning with the battle hymns of the revolution, and taking us through songs from the defining events of the Civil War, the fight for women’s suffrage, the two world wars, the Great Depression, the civil rights movement, the Vietnam War, and into the twenty-first century, Meacham and McGraw explore the songs that defined generations, and the cultural and political climates that produced them. Readers will discover the power of music in the lives of figures such as Harriet Tubman, Franklin and Eleanor Roosevelt, and Martin Luther King, Jr., and will learn more about some of our most beloved musicians and performers, including Marian Anderson, Elvis Presley, Sam Cooke, Aretha Franklin, Bob Dylan, Duke Ellington, Carole King, Bruce Springsteen, and more. Songs of America explores both famous songs and lesser-known ones, expanding our understanding of the scope of American music and lending deeper meaning to the historical context of such songs as “My Country, ’Tis of Thee,” “God Bless America,” “Over There,” “We Shall Overcome,” and “Blowin’ in the Wind.” As Quincy Jones says, Meacham and McGraw have “convened a concert in Songs of America,” one that reminds us of who we are, where we’ve been, and what we, at our best, can be. Jon Meacham is a Pulitzer Prize–winning biographer. The author of the New York Times bestsellers Thomas Jefferson: The Art of Power, American Lion: Andrew Jackson in the White House, Franklin and Winston, Destiny and Power: The American Odyssey of George Herbert Walker Bush, and The Soul of America, Meacham holds the Carolyn T. and Robert M. Rogers Chair in the American Presidency and is a distinguished visiting professor at Vanderbilt University. He is a contributing writer to The New York Times Book Review, a contributing editor to Time, and a fellow of the Society of American Historians. Tim McGraw is a Grammy Award–winning entertainer, author, and actor who has sold more than fifty million records worldwide and dominated the charts with forty-three number one singles. He is the most played country artist since his debut in 1992, has two New York Times bestselling books to his credit, and has acted in such movies as Friday Night Lights and The Blind Side. McGraw is considered one of the most successful touring acts in the history of country music. His last solo project spawned one of the biggest hit singles of all time, “Humble and Kind,” whose message continues to impact fans around the world. 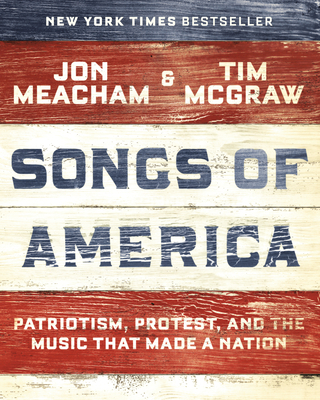 “From the songs of the enslaved to the sounds of the civil rights movement, from ‘The Star-Spangled Banner’ to Springsteen's ‘The Rising’ after 9/11, Jon Meacham and Tim McGraw have convened a concert in Songs of America. It is a glorious celebration of our diversity—and of the strength that comes from the myriad voices of all races that make us who we are."